One of the keys to your life destiny is the Luck Element. Understand your favorable and ill luck is the key to your success. Taiji represents the evolution of all that exists on this Earth. It is the ultimate principle of existence, the concept of equilibrium and harmony. In this Universe, there exist two individual natural form of energy - Yin & Yang. They are the opposite of one another but yet interrelating. And life is only made possible because of the interaction between them. We can never do without the existence of either of them. You can never have Yang without Yin and vice versa. All things that exist on Earth revolve around Yin and Yang. For your easier understanding, think of it this way. In life, there are always two sides to everything. For instance, we have the Male and the Female, Positive and Negative, Strong and Weak, Anger and Happiness and etc. And of course, not to be forgetting, the Good Luck and the Bad Luck. The Good and Bad Luck? Yes. One of the keys to your life destiny is the Luck Element. Understand this. In this life journey of yours, you are bound to experience both good and ill luck. Now, the question is when will that be? Just imagine. How helpful in life it can be if you were able to tell what kind of luck you are currently going through now? And to allow you to further and better understand the Yin & Yang Principle of life, here is how Taiji is derived? Taiji arises from Wu Ji, the ultimate nothingness. Wu Ji is what the ancient Chinese described as the state of emptiness before the creation of the Universe. It is represented as an empty circle. From Wu Ji (an state of stillness and harmony), changes took place. Day and Night, hot and cold, positive and negative, male and female etc were introduced. The separation of Yin & Yang took place. Following so, more and further changes repeatedly took place. The further correct understanding of Yin & Yang also followed. 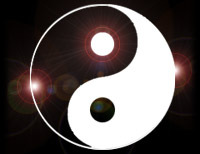 In the ultimate equilibrium of Yin & Yang, there can never be the perfection of each. Yes, nothing can be totally Yin or Yang. Within Yin, there is bound to be still the presence of Yang and likewise within Yang, there is bound to be still the presence of also Yin. Understand this. Within your times of good Luck, there are bound to still be times of ill luck. Similarly, within your times of ill luck, there are bound to still be times of good luck. And so to be saying, it is far too early to be giving up now. Yes, you may perhaps be at current, down on your luck. But it does not mean ill luck is going to follow you at all times and forever. For all you may know, your Favorable Luck may just be on its way. But of course, if you choose to remain despondent and sentence yourself dead, you will never be able to see the coming of this Favorable Luck; and this is what happen to many.